Bach wasn't in the habit of making major changes to his completed liturgical works, even when he was dusting them down for a repeat performance. 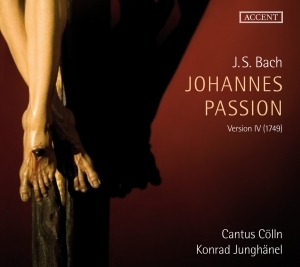 The St John Passion is therefore unusual in having been through four separate versions. Tracing the progress from one to another is no simple task, as revisions in one version tend to be reversed in the next. But the 1749 edition is, to all intents and purposes, the original 1724 version with slightly different orchestration. The biggest difference between the various versions is the opening chorus, and here we get the glorious Herr, unser Herrscher, in place of the equally glorious O Mensch, bewein dein Sunde gross, which also makes an appearance in the Matthew Passion. But more significant than the version in use are the performing conventions and the size of the ensemble. Cantus Cölln fields a choir of eight, so that's two to a part. The sopranos are female, as is one of the altos. The orchestra numbers 11, and includes a viola da gamba, although no contra-bassoon. That's a shame, but the continuo manages well enough without it, providing rich, early bass textures. I'm sure that Bach's intentions for the size of the forces in this work are open to question, but I suspect that most scholars would expect to hear more musicians than perform here. Yet the sound never feels constrained, and this isn't the sort of chamber music Bach that you'd normally expect from such a small group. The recording was made at the church of St Osdag, Mandelsloh, which is a modestly sized venue, although it doesn't sound it on this recording. The microphones have been set at some distance to pick up the resonance and meld the textures. The chorales come across best in this approach, with each phrase a continuous wave of sound. The solo numbers have all the clarity they need, and some valuable ecclesiastical atmosphere as well. But the choruses loose valuable detail in their counterpoint. It's not a big problem, and all the notes are audible, its just that contrapuntal clarity is the big gain of small ensemble Bach, so its a shame not to exploit it to the full. Konrad Junghänel chooses lively tempos, but he's not going for any world records. His speeds work well with the resonant sounding acoustic, although again don't really exploit the flexibility offered by the small ensemble. Among the singers, the most famous name, at least for British audiences, will be Amaryllis Dieltiens, a regular with the Netherlands Bach Society as well as many others. She sings well here, with some vibrato but not enough to upset the purists. The soloists are all good, and are well matched in terms of both style and quality. Tenor Hans Jörg Mammel offers friendly and reassuring guidance through the story as the evangelist. He has an impressive ability to reduce the colour of his tone for the plaintive recitatives. He also has a seductive baritonal quality in his lower register. As far as period performance goes, this is a very round and warm sounding Bach recording. It achieves a sense of atmosphere that you'd scarcely think possible from just 19 musicians. Yet there is intimacy too, and many of the qualities that period instruments have latterly restored to the piece are in evidence. The only problem is the resonance, and the efforts the engineers have gone to to assure us that we are in a church. It is hard to imagine hearing this piece without the halo of a church acoustic round its angelic harmonies, but you can easily have too much of a good thing.